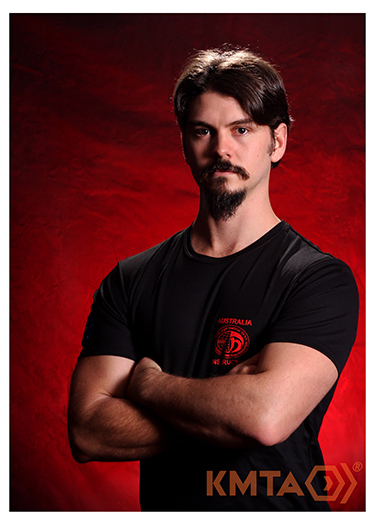 Peter began training Krav Maga in 2013, completing the Civilian Instructor Course (CIC) in 2015 with Tamir Gilad and Megan Berkman, and then the Kids Instructor Course (KIC) under the tutelage of Marcus Torgersen the following year. Peter is currently teaching in our Kids programs. “When I first started training in Krav Maga I was looking for a new way to challenge my fitness, I then quickly realised just how effective and practical the IKMF system and principles are and how important it is to pass this knowledge on to others. That’s when I decided to become an instructor” In addition to Krav Maga, Peter has 8 years of experience in various of forms of fitness training, with involvement in calisthenics, long distance running, CrossFit and obstacle racing. Outside of training, Peter is a project manager and designer at a ship building company in Brisbane, currently studying a mechanical engineering degree. In October 2017, Peter was voted in by the local instructors as Australian National Director for the IKMF, currently managing this role on top of his regular work and teaching duties.